Free PDF to Word Converter !! Hello Guys! It's been a long time since I wrote about any software. Today I've come with a great tool for you. With this tool, you can easily convert your PDF Document into editable Word Document! And certainly you get this for free! Choose the source file (PDF) from the left box. Select the destination folder from the right box. Limit the number of pages from General Options. It could be All Pages or specific range of pages (suppose 1 to 10). Unmark the options (Retains Shapes and Uses Text Box) to avoid unnecessary boxes in the converted document. You can choose either Times New Roman or Arial as the conversion font. Later you can change it while editing. As Doc Reader, you can choose either Word Pad or MS Word as your necessity. When you're ready to go, simply hit on the Convert button and wait for a few moments. Absolutely Free - No Serial Key Needed !!! You may refer to this step by step guide, it will teach you how to convert PDF and create PDF file for free. Including PDF to Word, document to PDF, Word to PDF, etc. Easy to understand and works pretty well for me. 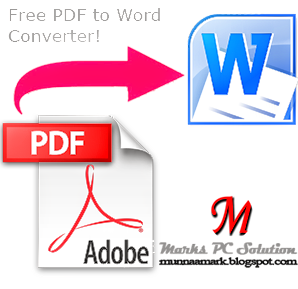 if you don't like to download and install software to your computer, you can try this free online pdf to word converter to convert pdf to ms word online. Activate Windows 8, Office 2010 & Office 2013 !!! Convert DOCX to DOC Online - 100% Free !!! Alexa Website Review Feature has been Stopped ! !